To learn more about this site and what you can do with it, you can start here! Hello. I’m Takis Athanassiou, and I’m an e-Business and e-Learning consultant! This is my personal blog, a place for recording my thoughts and ideas about leadership, productivity, effectiveness and the new media in general! It is a place for sharing my best ideas, approaches, and tools, that can help you achieve your goals! In this site, I write on issues related to business, e-Learning, leadership, productivity & effectiveness, management and time management, social media, tools, and concepts, while, occasionally, I write about various subjects (I think!!!) of interest. My goal is to create meaningful and readily applicable approaches, schemes, etc, providing insights, interconnections, and tools that, I believe, can create a positive difference in various areas, and empower the people in their everyday personal and professional life. I try hard and (I believe!) smart to give you the concepts and the resources that can help you develop yourself and your business! I develop ideas, approaches, methods, resources, assets, and tools, that will help you to grow and better your personal and professional life! Why I’m different? Simply because, I pay attention to the requirements and the needs of the people, I listen carefully to what they have to say, I’m a hard-working creative person with a large experience on human, business and technology requirements and try to find the best available solutions for my associates, clients, friends or the people I work with! For more information on me, please visit the about page. For Who This Site Is For? This site it is, primarily designed for entrepreneurs, freelancers, small business owners, and all the people want to find information and approaches to enhance their personal and business lives. Along the way, though, the site is broadening its scope and today is a place for is for every restless person, wants to do more effective things in every day or wants to change the way he/she lives and works. It is for people do who not settle with the mainstream usage and explanations given on how things work and try to customize the things, systems, tools, ideas and approaches to their needs and requirements and not vice versa. Furthermore, it is for people want to learn more, communicate and networking meaningfully, learning more things to enlighten their lives and the lives of the others. In short, this site is for everyone, who he/she does not take for granted anything, does not choose to use shortcuts and easy solutions and he/she is prepared to invest in him/herself, to make his/her world a better place to live, work and play in! Finally, it is for people know well, that some things can be achieved better if you start sharing your ideas and approaches pro gratis and moving with a good company of like-minded friends! As a business person, I know well that a business can only be greater when it has a lot of ideas for dissemination and support by trusted clients. A Highly Effective Blogging Framework! Who are you going to be in 5 years? If you want to find something specific, you can always use the search box at the sidebar. My most valuable resource in this site is undoubtedly my newsletter. It is my personal channel of communication with my readers and a source of information, news and items can help you achieve your personal and professional goals. 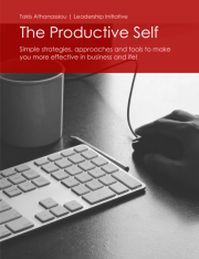 With your subscription to my newsletter, you get the free book, “The Productive Self‘, a guide to help you enhance your productivity (you can always use either the e-mail subscription – Get Your Free e-Book – at the sidebar or the Subscribe page from the menu). Along to that, my site provides as well a lot of resources you can exploit to your benefit. For this reason, I suggest you start by reading some posts of interest from my small list, provided to my about page or to browse freely on my site until locating something of interest. This going to give you a first impression on what this site has to offer you. For authors, writers, and people interesting at guest blogging on my site, I suggest to taking a look here for some guidance! I’m a professional in e-business and e-Learning area, but I’m also a constant learner of all the new things related to my life and work. When it is possible I try to provide you the best of my insights, ideas and knowledge via my business, this blog and various other digital channels! I do not claim that I have all the answers, but I do my best to provide some valid ones! So if you feel like it, or if you have questions you think I can help, or if just want to say hello, please feel free to communicate with me! The best way to communicate with me is to use the contact form located on my contact page or use any other digital channels your think as suitable! I usually answer all the e-mail myself and I would be glad to contact me even for saying a simple hello! It would be much appreciated! You can always subscribe to my mailing list and get my posts delivered directly to your inbox. My newsletter is not just a channel for getting my post in your mailbox but my prime channels for communicating with you and provide my best strategies, tactics, and approaches to achieve your goals. Finally, I would like to thank you for all your support. If you like what you find here, I would like to remind you that this is just one place of information of interest and that you can take a more active stand by participating, follow, like and comment on my Facebook and Google pages. These pages along with some private groups consist a larger community of like-minded entrepreneurs, small business owners, and freelancers which interact and strive to find solutions to their problems while they help each other. You are welcome to participate. Thank you again for all your effort and support! Keep in touch!